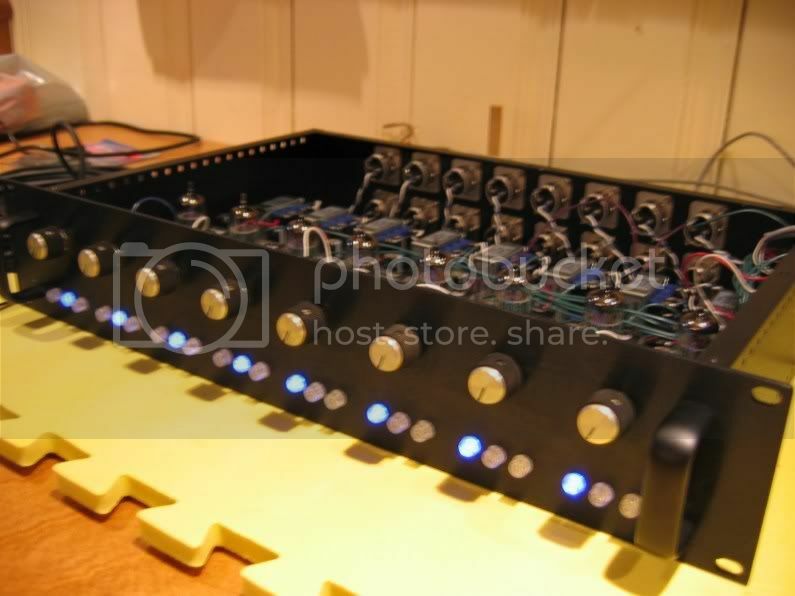 Here's a few pics of my most recent DIY.... 8 channels of NewYorkDave one-bottle mic pre in a 2 rack space chassis. I just finished tracking a band and I love how this baby sounds. Just for variety I laid out the PC board with a dual footprint for cinemag and also lundahl input transformers. You can see in the top view pic that the first four channels have the cinemag and the others are lundahl. Now I find that I've got some troubleshooting to do. I was in such a hurry to get this ready for tracking the band, I literally made the last solder joint minutes before the session started and so I didn't have time to check voltages or anything. It was clean, passing signal and no hum or noise....that was good enough for me so I bolted it in the rack and used it for the session which took about 1 week. Tubes are NOS GE JAN dated 1977. All resistors are PRP metal films except for R9 which is a Kiwame. R12 is 22k. I lowered the value of C5 to 10uf. I also bypassed C5 with a 0.01 uf cap. All other component values are as per the original schematic except for C4 (as was noted) I used a 4.7 uf film cap. R10 was eliminated....transformer out only. 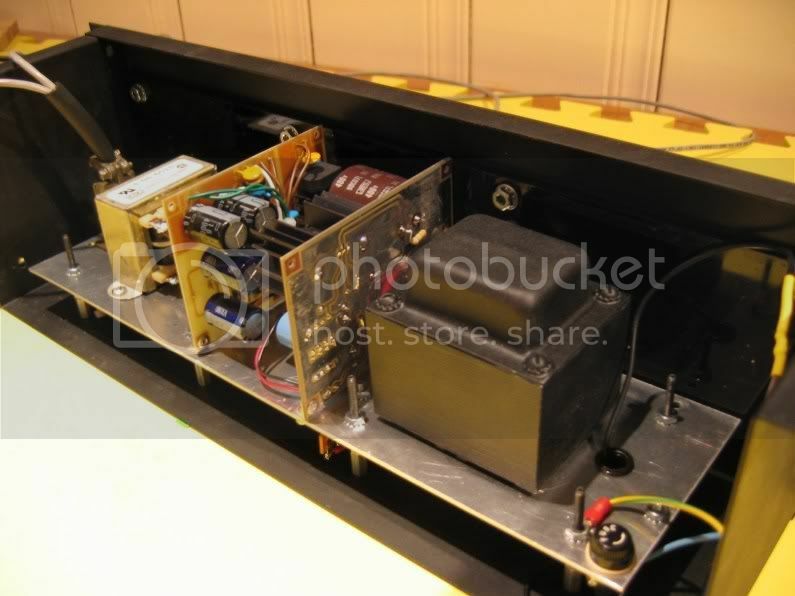 Output transformers are Edcor WSM600/15k. Thanks in advance and also a big thanks to Dave! but the whole build looks pro ! re; the voltages Do you have the 220k to ground on the output ? are all the other ground references grounded ? Notice that the output stages (pins 6 and 8 ) on the "bad" channels are not drawing as much plate current as they should; the symptoms that point to this are the too-high plate voltages and too-low cathode voltages. Check component values in the cathode, grid and plate circuits, make sure ground (common) connections are good and try swapping tubes and see if the problem follows the tubes or stays with the channels. Of course, keep careful track of which tubes are which, maybe mark the channel # on each tube's envelope with a Sharpie before you begin swapping. Good luck! Hey Freddy you beat me to it. Can you check the tube socket connections at the heater supply pins of the tubes. I see you have board mounted sockets. Heat travels out of the tube via the heater pins vibration and heat can cause problems with PCB mounted sockets. Hey thanks Dave and everybody! Wow that box looks awesome! Have a great New Years/Anniversary. would love a pcb layout for this as well!!! Seeing you back made my day. I'm finishing a "Stereo" 1 Bottle as we speak. I LOVE the One-Bottle pre man... thanks for sharing & coming back around. About those Upgrades (or MOD's) you mentioned a LONG time ago. I built it like the first post & really like it. It does VERY cool things to vocals + the DI is KILLER on Keyboards & Bass. Example: I actually liked what it did to my vocals using a U87... better than my favorite combination, U87 & Neve 1272. Note: the input transformer you choose will (most likely) completely change the sound & feel of this preamp. I'm using some old Triad 600:60k input TX's & I LOVE what they're doing. Lots of character... I'm sure a "Cleaner" Cinemag would be just as cool but different. 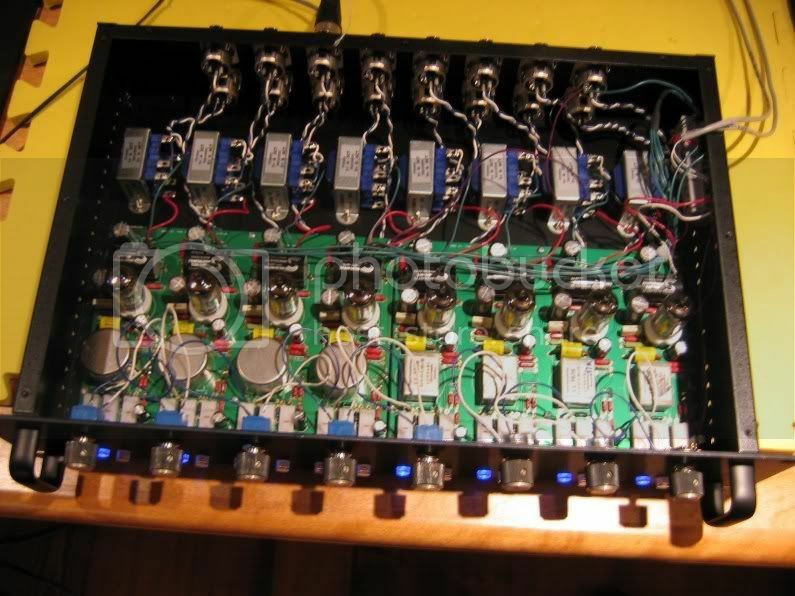 15K:600 output transformer, eliminate High-Z output jack and R10. Change R13 to 4.7K (this results in higher plate voltage and current, nets a couple dB more maximum output). Change R12 to 22K, which allows C5 to be reduced in value. (10K was too low, really... excessive load on V1B plate at minimum gain setting). Also, How much gain will be lost by adding the out TX? OOOOOOOOh... sorry Freddy, I LOVE your build man. VERY KILLER!!! I wish I could help but troubleshooting is tough over the net. Also, each channel should have it's own decoupling BUT the main supply resistor sets the current for ALL channels... so disconnecting channels & tubes MAY throw things off. I say this because i was going to suggest focusing on or connecting one channel at a time to test things but I'm not sure if you can. (I may be wrong here ) Just trying to help. Does EACH channel branch off the MAIN supply? Also, Who did your PCB's? They may be cool to offer or share the design with Gustav if you can get the bugs worked out. I have never built a 1 bottle preamp. But I would think that each preamp would need it's own set of power supply caps to store energy for peaks. And maybe the wacky voltages are incorrect resistors somewhere. I would check them. Really awesome box tho! Got any samples from the mix? and modulating another channels signal through that . If I read the first post correctly. It worked fine for a few days before the 5 channels started to distort. So the troubleshooting should first be to find what changed. Using the same known good tube in each channel and taking readings is maybe the first step I would do. Also I see 3 electro caps for each channel maybe one is for RC decoupling but without the schematic of this build things are just a guess. I wonder what kind of hum/noise you're getting with such tight layouts? Does this apply to a regulated PSU as well? I was thinking of using a G9 style B+ for my next one-bottle or MILA project. Can I just feed, say, the two channels 245V directly? Or should I still drop from 300V with a separate R/C for each channel? the G9 has a "PSU Stab" R/Cs for both channels, that only decouples the input stage. The SRPP stage still gets a shared 245V for both channels it seems. Seems to work, but is there any reason to avoid it for MILA or one-bottle type gain staging? Freddy, that is an AWESOME build! Where did you get the lighted switches? Are they LEDs? They look very cool. As to debugging, your voltage readings suggest that you aren't passing much current through the "bad channels". Your plate voltages are high because of this (not a lot of current, so little voltage drop across the resistor), and your cathode voltages are similarly low for the same reason. Normally I would suggest that you check your plate resistors as it seems like they might be smaller than what the schemo calls for (i.e. lower resistance yields a smaller voltage drop with the same current), but considering that the unit worked fine to start with but now is distorting, I doubt this is the issue. Still wouldn't hurt to verify that all the plate resistors are in working order and the correct values. The switching tubes idea is a good one, but it seems hard for me to believe that 5 tubes would go bad that quickly, unless of course your filament voltages are waaay high. So check those too. A good first test would be to take a tube from a "good" channel and swap it with a tube from a "bad" channel. Fire up the unit with both tubes in place and see if the good and bad channels have switched. If so, your issue is solved. If not, you're possibly looking at some kind of issue with the components or wiring surrounding the plate supply there. I've never done pcb mounted sockets but have heard of issues with bad connections due to heating/vibration as someone else mentioned before. 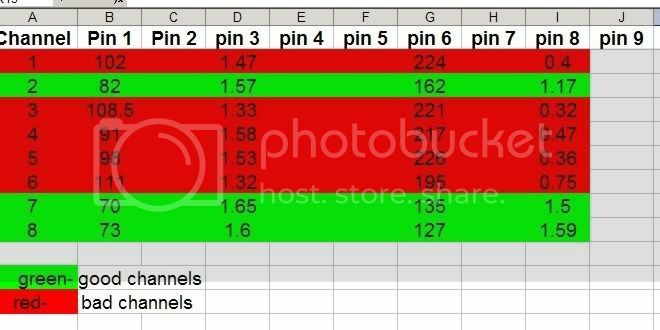 Also, it might be helpful to see a schematic of how you are supplying the B+ across the 8 channels, there might be some things to look at there but we can't tell you considering that we don't know how you have that set up. Anyway, that is one fine looking build. Please keep us posted on how the troubleshooting goes, it is always helpful to share this kind of information for future builders. FYI, before I found the heater problem, I swapped tubes as suggested and the good and bad channels did follow the tubes. Seems strange to me that they all sound good now, when before the 5 "bad" ones sounded bad no matter what channel they were in...I was sure those tubes were cooked.....any explanation for this? NewYorkDave 2 bottle- output attenuator?